Headed to the movies this weekend? 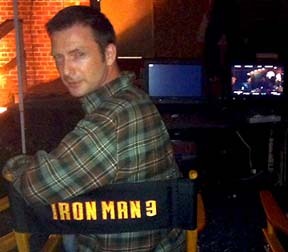 If you see Iron Man 3, you might see some familiar faces. Maj. Erin Karl writes that five members of the 916th Air Refueling Wing from Seymour Johnson Air Force Base, N.C., were selected as extras for the film. A little more than a year ago, the blockbuster film starring Robert Downey Jr. and Gwyneth Paltrow was filmed throughout North Carolina. The casting company made an extra push to use members of the military. Executive officer Maj. Thaddeus Janicki, Security Forces member Master Sgt. William Lester, 567th Red Horse member Master Sgt. Williams Fields, and public affairs photojournalists Master Sgt. Wendy Lopedote and Staff Sgt. Mark Thompson were selected as extras. Lopedote’s husband Ben, a retired chief master sergeant from the 916th, was also cast. Lester was cast as a security guard during a shoot at the SAS campus in Cary, N.C., his civilian employer. While each had the opportunity to be filmed in a few scenes, only a few members actually got screen time. You can see Fields and Lopedote during the Air Force One scene. All the other scenes featuring 916th wing members — including a speaking role given to Thompson — ended up getting cut. But there’s a chance some of their scenes might be included in the director’s cut version of the film. Thompson and Janicki have since worked as extras on other movies and a TV series filmed in North Carolina. Iron Man 3 has been in theaters now for 23 days around the world, racking up $1 billion globally and $300 million domestically, according to reports. If predictions are right, that makes the film the 16th biggest film ever and the 5th highest grossing film of all time when all theatrical grosses are in. To learn more about the wing members’ scenes and screen time experience, click here. And click here for the Military Times’ movie review of the film.